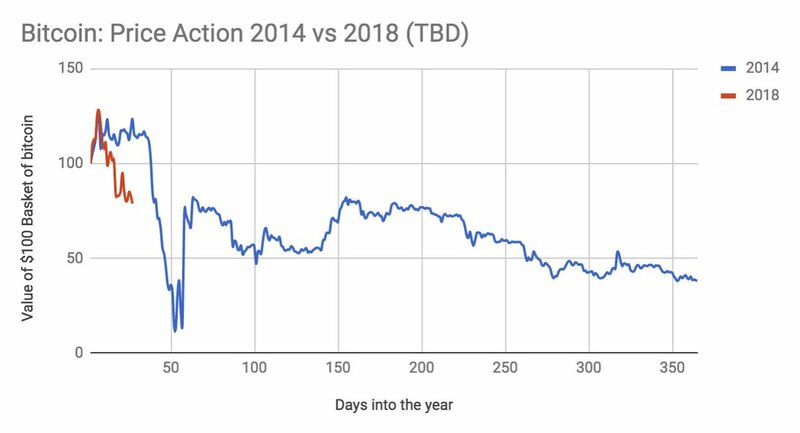 4/ The #crypto markets continue to feel wobbly at the start of 2018, just as they were wobbly at the start of 2014. February was a bad month then, February could be a bad month now if we get a #MtGox style calamitous event. 5/ Fun #crypto fact for relief: @twobitidiot was the person who originally broke the news around the #MtGox hack. 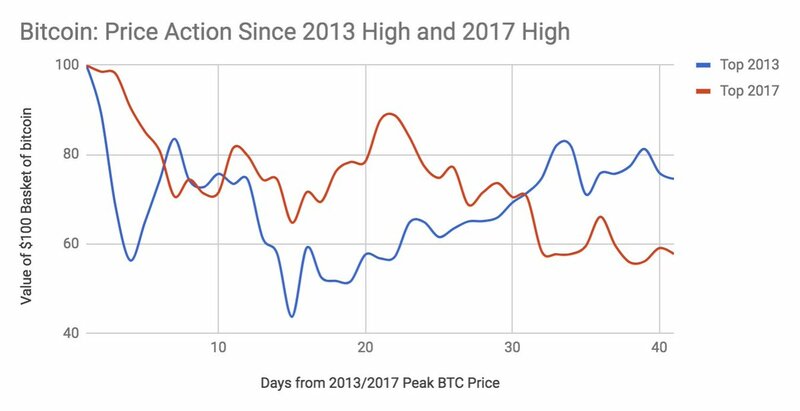 6/ If we instead look at #bitcoin's price action since peak prices, again we see that the drawdown thus far in 2017/2018 has been worse than what we saw in 2013/2014. 9/ So while the current #crypto market setup is grim, I don't expect us to suffer in 2018 the way people did in 2014. If you're in it for the long haul, then you shouldn't care -- prob best to not even look @CoinMarketCap @onchainfx etc. Parts of this piece hit home personally, and also for what I see in some of my peers. Especially important to read if you’re feeling like life has become one big to-do list. And thank you @annehelen, thought it was an amazing piece! 1/ Blockchains collapse the cost of digital asset creation, custody & transfer, enabling *programmable value* of all kinds. 2/ Money, while an important application of blockchains, is a subset of the broader programmable value universe. 3/ A money like #bitcoin is likely to be the greatest *single instance* of value capture within the programmable value universe, which is why many of the top #cryptoassets today are battling for this position. The mainstream has almost entirely forgotten about #bitcoin again. In conversations with people from home, many recall the #crypto hype from a year ago, but have stopped paying attention since. Yes, there are a lot more “decisions makers” that have gained a basic understanding of #crypto, which is great. And the technologists & financial folks that feed off the bleeding edge continue to pay attention, invest, or build, just as happened in 2015. The difficulty adjustment in #Bitcoin mining is an entirely new element introduced to commodity markets. In the oil market, capital expenditures follow price as private/national oil companies balance investment w/ break-even prices and supply/demand imbalance. 2) We still may see a decline in hash-rate, as there is usually a lag between price and investment. Committed capital during a period of euphoria in prices makes its way to the market after the fact. Below is a chart of how oil price affects rig activity. #Bitcoin has had a fascinating affect on libertarians and "the freedom movement." Like an ultimatum, it has split libertarians into two separate camps, Neo-Austrians (cypherpunks) and a postmodern libertarians. The former is characterized by a focus on technology, money and the pursuit of truth, while the latter is focused on pragmatic politics and postmodern libertarian skepticism. Bitcoin is unyielding. It forces formerly well-respected Austrians into logical inconsistencies, contradicting themselves, as they attempt to dismiss it. They refuse to approach Bitcoin rationally, so end up rejecting technology and science, too. I want to go ahead and talk about logic for this rally. 1. In a bear market, any pump would be to dump harder, which has been the case throughout this past year. All of the past rallies were achieved via Bart patterns, signally a lack of real buying volume. However, we can clearly see that this most recent rally was achieved via pump + organic buying volume. We had consolidation instead of retrace throughout the rally, price moves that mirror moves of 2017. So why are volumes coming back? Without change in fundamentals, any serious pump would be to liberate trapped higher-up positions and a colossal waste of money for the bulls. Bulls won't be stupid enough to blast through many critical resistances allowing higher-up positions to exit. On the surface, that seems right. BUT, is there more to it than that? Can altcoins show strength while BTC declines? Has it happened before? 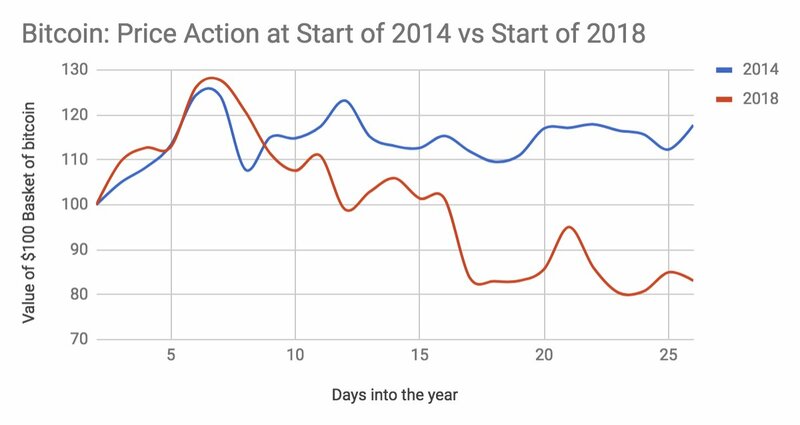 We’re going to analyze altcoin cycles using this customized graph. 3/ again - in the 78.6%/88.6% fibonacci retracement while mass media will tell us that #Bitcoin is dead (again ?). And we will probably have our "final" 5th wave which could drive us above 1 million $ per $BTC. 1/ Everyone wants to know when #Bitcoin will bottom. I have some good news and some bad news. Which would you like first? 2/ Bad news, right? Everyone wants the bad news first. If you can stomach the broccoli you'll get rewarded with dessert. At least, that's what I tell my daughter! 3/ Ok, here goes: bear market bottoms are NOT formed as sharp V-like corrections, retaking the highs; that's what bull markets look like.